I love cats and usually find gifs of cats amusing or cute. Some are realistic, others show cats doing things they just can't do in real life. Why do cats rub themselves against your legs or your face? Have you ever wondered why your cat likes to rub up against you repeatedly? A cat will rub her/his head against things, including you, to transfer their scent. This is a form of territorial marking, to let other felines know you are part of his/her territory. There are glands around the cat's mouth and chin which produce pheromones and these are rubbed onto anything a cat wants other cats to know is his/hers. Why do cats chase or play with all sorts of things that move? Cats will play with a piece of wool dangled in front of it. I have read it is unwise to let a cat play with wool (or string, tinsel, dental floss, sewing thread etc) in case it is swallowed. A cat's tongue has tiny barbs (papillae) on it which face backwards. These barbs enable a cat to groom itself, removing debris and loose hair from her/his coat. However, these barbs mean it is impossible for a cat to spit out anything that gets caught on its tongue and swallows it instead. This can result in a blockage which will require treatment from a vet or, in the worst case scenario, death of a beloved pet. Cats are naturally inclined to play with or chase anything that moves because of their hunting instincts. It doesn't matter that the object may not be edible. Kittens are particularly likely to play with any moving object or try to get at something they can see moving but are unable to reach. A few people claim to have taught a dog to recognise as many as 30 written words. I haven't come across any such claims for cats. However, an idea for getting children to practice reading aloud at home is to suggest they read to a pet such as a cat. Perhaps you could find some stories about cats and let the child read those to kitty. 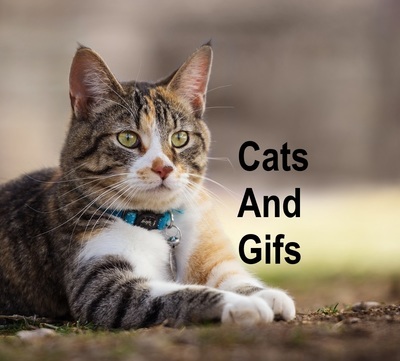 I am not sure which is funnier, a gif of a cat doing something it couldn't in real life like reading a book or one where a cat has just been caught up to an amusing antic.